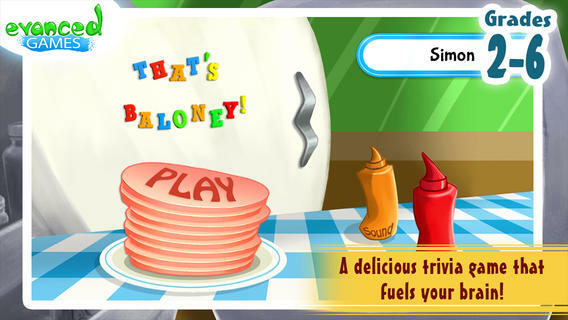 FREE for a limited time – That’s Baloney! Kids Quiz Game, an app based on the best-selling card game by Edupress™. This educational app features almost 2,500 quiz statements for grades 2 – 6. Kids show off their trivia skills by determining whether the statements are true or baloney. The game can be set to 5 different categories: language arts, math, science, social studies, or mystery meat. Each snack round features 10 questions. Sandwich rounds can be set for 20 or 40 questions. Some examples of the facts/trivia included are: 8 is an ordinal number; An average American has about 20 square feet of skin, weighing about 8 pounds; The zip code 55555 belongs to Young America, Minnesota. Kids must answer carefully because the game is over if they lose 4 or 5 pickles along the way. This app is cutely deigned and appealing to kids – a fun educational app! Teachers, this app would be a great time-filler for your classroom – perfect for the end of the day, right before lunch, while your waiting to be called to an assembly, etc.